1945 CIG. GIFT TO TROOPS REPLY CARD 224 GROUP COMMS. SQN. 1945 CIG. GIFT TO TROOPS REPLY CARD 224 GROUP COMMS. SQN. R.A.F. S.E.A.A.F................ these small cards were included with gift packs of cigarettes sent via the Overseas Tobacco Fund organisation. 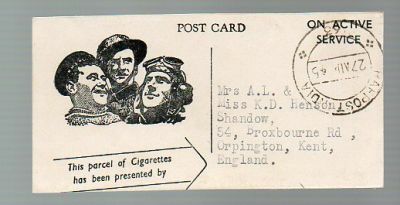 Members of the public gave donations at collecting points in shops, left their mailing details and when cigs were sent out to the Forces a pre addressed card was included using names off the donation lists. The recipient was then expected to send the card back to the donor....as was done in this case.